www.chicago-photographs.com is a site for Friedman Fine Art, featuring contemporary and historical photographs of Chicago. Located at 225 North Columbus Drive, Aqua is an 82-story skyscraper in the Lakeshore East development in downtown Chicago. The building contains 55,000 sq ft of retail and office space, 215 hotel rooms, 476 rental residential units, and 263 condominiums. Aqua was the first downtown building to combine condos and apartments with a hotel. At a height of 870 feet, the skyscraper is topped by a 82,550 sq ft terrace with gardens, gazebos, pools, a running track, and a fire pit. It was named #22 on Chicago Magazine’s list of the Top 40 Buildings in Chicago. 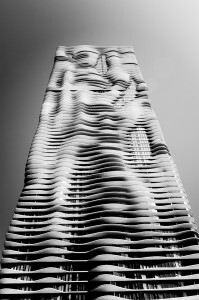 The Aqua was named the skyscraper of the year, receiving the Emporis Skyscraper Award in 2009. Designed by Jeanne Gang of Studio Gang Architects, the building was the largest project ever given to an American firm headed by a woman. Construction of the building began in 2006 and the building was finished by 2010. Concrete balconies resembling waves protrude from its surface. Each floor plate in Aqua is unique, resulting in artistically unequal balconies. Magellan Development Group LLC named the building “Aqua” for these wave-like balconies. Its proximity to Lake Michigan also influenced the name. Gang gave the building sustainable features like rainwater collection systems and energy efficient lighting. She and her team made the terrace extensions maximize solar shading. The green roof on top of the tower is the largest in Chicago. Follow the link to purchase marvelous photos of Chicago.